Sub-Saharan Africa is not only the fastest growing region of the world demographically but is also one of the most vulnerable to climate changes, according to many measures, and already facing natural resource scarcity in many areas. These factors combine with existing development challenges to create security threats that African governments and the United States should be concerned with, says ECSP Director Roger-Mark De Souza in a presentation for the Africa Center for Strategic Studies’ introductory course on demography and the environment at the National Defense University. Climate change and natural resource management are core factors in many of the security and health concerns that have afflicted the sub-Saharan region, says De Souza. As such, addressing them will aid in mitigating some of the further health and human crises in the region that have contributed to instability, failed states, and human migration. “We’ve really moved from environmental issues as ones we typically talk about in terms of…those who are just concerned about conservation [to] recognizing the centrality of natural resource management and what it means,” De Souza notes. In a 2012 study conducted by De Souza and colleagues at Population Action International (PAI), he says they found “a number of countries in sub-Saharan Africa are projected to continue to grow, while at the same time agricultural production is declining.” “Food production per capita has been stagnant from 1960 to 2005,” he says, with projections indicating this agricultural recession will continue (supplementary studies found here). “We worked with a number of climate modelers that came up with indicators for climate resilience on a national level, and overlaid these with population dynamics,” De Souza says. “We discovered that most of the countries in Africa are not very resilient to climate change…the ones that are the least resilient are the ones that are also experiencing rapid population growth.” Rapid population growth is driven by high unmet need for family planning along with low literacy rates and a lack of access to adequate medical care. Rising sea levels threaten coastal cities and island nations with natural disasters, rising temperatures spread tropical disease to new regions, and increased migration of populations away from coastal and drought-prone regions results in economic and agricultural displacement – a major issue on a continent struggling with refugees, environmental- and otherwise. High vulnerability regions for these varied threats are often mutually inclusive (see above). The PAI study identified 15 “hotspot” countries that have “high projected population growth, high projected declines in agricultural production, and low resilience to climate change.” These nations also face widespread conditions of water stress or water scarcity (defined, respectively, as below 1,700 cubic meters and 1,000 cubic meters of water per person annually). De Souza singled out Burkina Faso, Djibouti, Malawi, and Somalia as particularly vulnerable. De Souza makes the case for a reassessment of the role of domestic and foreign military presences in Africa and more closely examining environmental change as a factor in security and stability. 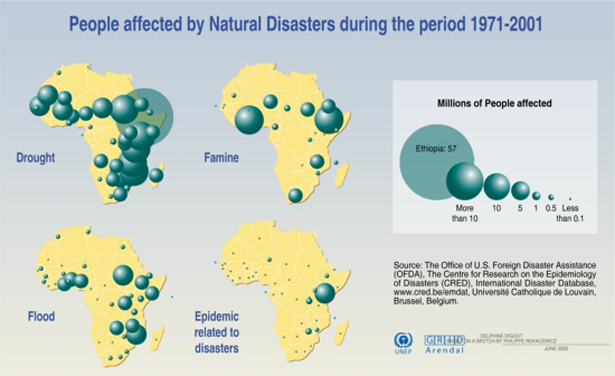 A 2009 report by the UN Environment Program illustrates how climate change affects natural resources at the center of many conflicts, he said, such as arable land, water, fisheries, and forests. While they may not be the only causal element, when these resources are scarce or disputed, they can intensify conflicts, such as in Darfur, where a 30 percent decline in rainfall over the past half-century has played a part in escalating violence. Sources: Population Action International, UN Environment Program. Video Credit: “African Security Issues – Wilson Center – Roger Mark De Souza: Demography,” courtesy of the Africa Center for Strategic Studies. Chart Credit: UNEP/GRID-Arendal.